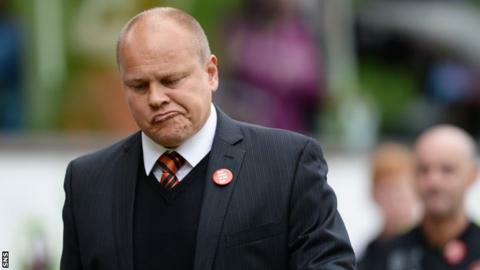 Dundee United head coach Mixu Paatelainen believes some of his players may not realise the precarious situation the club is in. United are two points adrift at the foot of the Premiership table and take on Aberdeen at Pittodrie on Saturday. "One or two maybe think this is just temporary, maybe they don't realise just how serious the situation is," the United boss said. "The sooner we realise that, the better." The Tannadice side have won just two of their 13 league fixtures this season, and crashed out of the League Cup after a 3-0 quarter-final loss to Championship side Hibs. Paatelainen warned his players to brace themselves for more tough times ahead, but believes they will emerge stronger at the other end. "It's going to be a long winter for us," the former Finland manager continued. "There will be matches that we are not up to the standard that we want, and there will be matches that we are. It will be up and down. "As long as slowly we improve, play better, keep the ball better, defend better, then if that trend is positive then I'm happy." The United manager did concede that the job is tougher than he had envisaged when he agreed to take over. "I think it is," Paatelainen said. "From every match we get knowledge and information on what we must do better with, things we need to look at. "We need to stay patient. If you start looking at the big picture and think 'oh it's a big task', you panic. "What's important is that we stay calm, patient, make sure we work every day, and bit by bit we get better." The Finn also believes the players will need to improve their fitness levels if they are to steer themselves away from bottom spot in the table. "It is surprising to me when we have a hard session, not a killer, one or two comments are that it was the hardest session they've ever had," said the manager. "I'm sure that's not the case. Maybe their fitness level will improve in due course. We do have hard sessions. "Of course we want to balance that with plenty of rest as well so that come match day the boys are ready."